Bingers! Are you ready for summer? Got those plans yet? Have you booked your hotel reservations yet? Do you already know where to go? But most of all, are you ready to experience traffic and a huge crowd in, say, La Union or Baguio? If not, well, let’s go somewhere new, somewhere off the beaten track. Let’s head up north to Nueva Ecija at Armando’s Garden Resort! We got the details so make sure to read this one! Before the holiday break last year, my friend and fellow blogger, Myrra sent me a DM on Instagram inviting us to experience a resort in the north. The spontaneous kid that I am said ‘yes’ in an instant. I mean, who would say no to a travel, right? And so, one Friday night, we were picked up by Tito Armando, the owner of the resort himself, in Ortigas and that started our 4-hr journey to Nueva Ecija. I dozed off most of the trip in preparation for the day of swimming and taking lots of photos. We left Ortigas at 3 AM and we arrived at the resort just in time for breakfast at around 7AM. The sight of the sunrise setting over the resort welcomed us. The view reminded us that we are up for some great time and have a great time we did! Armando’s prepared a wide array of food for breakfast off of their menu. There were daing na bangus, eggs, inihaw na liempo, and the great-tasting tapa! No Filipino breakfast is complete without a cup of strong coffee and of course, I helped myself a cup (or was it two?) Right after the meal, we were brought to our room for some quick rest. What would have been my quick rest had gone full sleep and next thing I know, it’s lunch time. Basically, I went there to eat, sleep, and take some shots. lol But really, their lunch was AWESOME! Armando’s Garden Resort offers buffet as part of their services and they gave us a taste of it during our visit. One food that stood out the most is their turon! We loved it so much that we joked around whether it would be possible to have them delivered via GrabFood in the office! For a resort with such pretty design and accommodating services, I thought that it would come at a price. I expected the entrance fee to be at least P300 per head but was I wrong? Tito Armando, the owner himself, shared to us that residents of Cuyapo and its nearby towns can have a great time at Armando’s without breaking the bank! For an entrance fee of P120 for adults and P100 for children, families are bound to experience a fun summer! I remember listening to Tito Armando’s story during the drive that he did not have an easy life growing up and now that things have turned around for his family, this is his one way of giving back. Creating luxury and tagging it with an affordable price was his way of paying it forward. 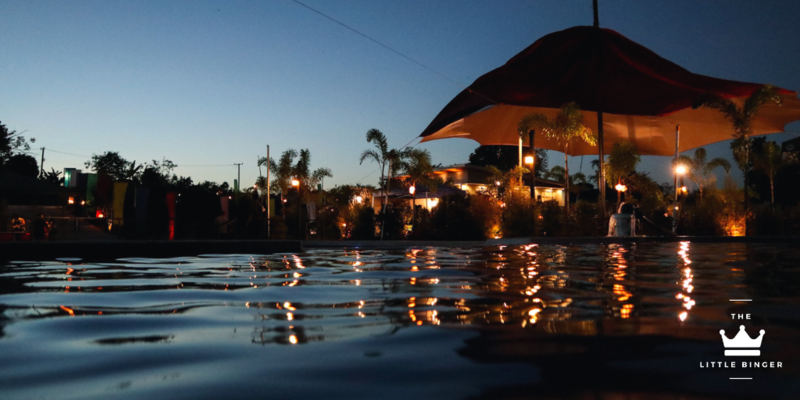 Whether you live around Cuyapo or are always up for a roadtrip to experience a new destination, Armando’s Garden Resort is the place for you, your friends, and your family! The newly-opened resort has complete and, I must say, pretty amenities that will let you unwind without worrying about the budget. Swim, chill, and feel at home as their staff shower you with a one-of-a-kind level of hospitality! Go off the beaten path this summer and head on over to Armando’s Garden Resort!